The fixed infrared camera pyroview 160 L is ideal for application in fields of process management and control, quality control, fire detection as well as measurements in research and development. Production processes can simply be optimized by means of the fixed infrared camera. For evaluation of the data recording the infrared camera is equipped with digital and analogue in- and outputs. Thus you can always transfer the data to a computer and analyse them detailed with the software included in delivery. It is an online software that allows monitoring and remote controlling the fixed infrared cameras on system softwares from Windows. All that commends an application of the fixed infrared camera in continuous operation. 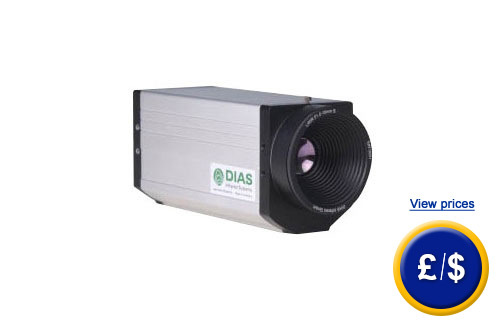 The whole fixed infrared camera, including electronics, is accommodated in a robust aluminium compact enclosure and thus even applicable in severe industrial fields. Through the protection type IP 54, the camera can also be installed in environments with humid conditions. An overview of all infrared cameras you can see here. For further information about the Fixed Infrared Camera Pyroview 160 L, please read the following technical data or call our Hotline: UK customers +44(0) 23 809 870 30 / US customers +1-410-387-7703. Our technicians and engineers will gladly advise you regarding the Fixed Infrared Camera Pyroview 160 L or any other product in terms of regulation and control or scales and balances by PCE Instruments.